Star Wars Character Boba Fett Was First Revealed To The Public In A? Which Iconic Video Game Symbol Was Originally A Family Crest? The history of Boba Fett’s early appearances is full of little surprises. Most people assume that his first appearance was in 1980’s The Empire Strikes Back (which, in fairness, was his first silver screen appearance). Super fans might know that, in fact, his first appearance on screen was via television, courtesy of the 1978 Star Wars Holiday Special (an odd TV-only Star Wars event that fans have regarded as a bizarre curiosity ever since it aired). Super duper fans, however, know that the public first caught sight of Boba Fett not on the silver screen or the television screen, but on the street. 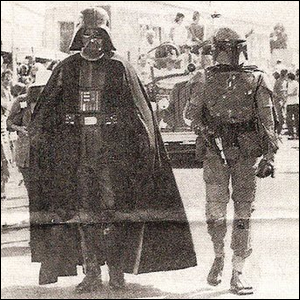 On September 24, 1978, Boba Fett first appeared marching alongside Darth Vader in the annual San Anselmo Country Fair parade. What exactly was the bounty hunter doing in a small town parade? The small town in question just happened to be home to the “then” headquarters of Lucasfilm and the armor for Boba Fett had just recently come in from the special effects designers in England. Everyone decided that it would be fun to have somebody suit up in the armor and walk alongside Darth Vader in order to offer a sneak peek at the costume and drum up a little interest—but other than a few kids asking questions and the local press running a photo of the two villains striding down main street, it would be years until the general public got a good look at Boba Fett in action. Image courtesy of the Independent Journal.